Use %DeepSee.Component.Portlet.abstractPortlet as a superclass. Implement the %DrawHTML() method, which should draw the body of the portlet as HTML. Also see Using Settings for additional options. Optionally implement the %OnGetPortletName() method, which returns the localized name of the portlet, to display in the Widget Builder dialog box. Otherwise, the short class name becomes the portlet name. Optionally implement the %OnGetPortletIcon() method, which returns the URL of the icon for the portlet, to display in the Widget Builder dialog box. Otherwise, the system uses a generic icon. Otherwise, the portlet has no settings. 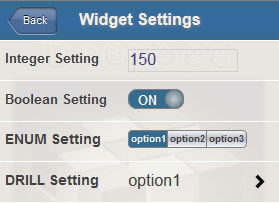 To define settings to be listed in the Settings menu for this widget, in the Dashboard Designer. type is the type of the setting. See the following subsection. pSettings is a multidimensional array that is passed to this method; it contains the values of any settings passed via the URL. For details, see the second subsection. "ENUM^caption1:value1,caption2:value2" or a similar form. In this string, caption1 and caption2 are labels to display in the Dashboard Designer, and value1 and value2 are the corresponding values that are actually used. In practice, a setting of this type can provide only a few options, before the Dashboard Designer runs out of space to display them. See the next item. "DRILL^caption1:value1,caption2:value2" or a similar form. In this string, caption1 and caption2 are labels to display in the Dashboard Designer, and value1 and value2 are the corresponding values that are actually used. And the method could use this value to set the size of the portlet. /// Static HTML display method: draw the BODY of this component as HTML. Set tPct = tPct _ "%"
This example displays static data, but your portlet could display real-time data. For a more complex example that also defines settings, see DeepSee.Model.PortletDemo.ClockPortlet in the SAMPLES database. You can also define a portlet that accesses data, because %DeepSee.Component.Portlet.abstractPortlet implements the ZEN dataView API. To take advantage of this option, you should be familiar with Zen. This causes ZEN to render this component on the client. Implement a client-side renderContents() method. This should (a) connect to the dataController, and (b) create dynamic HTML and use it to render the enclosingDiv of the portlet. // do we have a data controller?